Welcome to all children, parents and prospective parents. On this page you can look through images of our learning and find useful documents, including our .prospectus. We have many exciting plans ahead this half term. 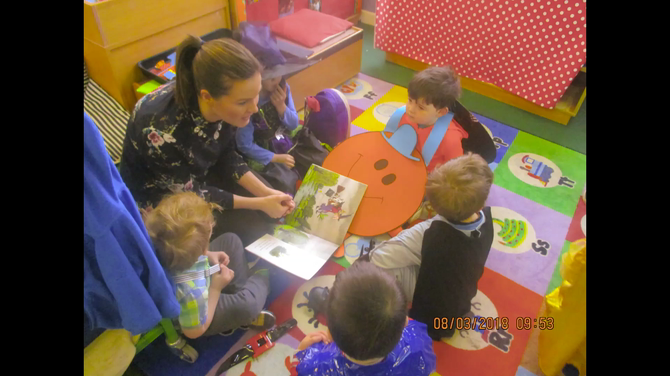 We come to school each day ready to follow the children's ideas in our learning--- this way, every day is new, different and challenging in Nursery! World Book Day was a great success! Thanks to all the parents who came to share books with us. It was also a pleasure to have the children from Class 3 reading to the Nursery children. Free Early Education Entitlement for 2, 3 and 4 year olds Lots of useful downloads and information on Oldham Council's website. Help with Childcare Costs "You may be able to get help form the government to pay for childcare like childminders and nurseries. You must use 'approved childcare' to qualify for hlep"
Childcare Vouchers - Better-off Calculator "Childcare vouchers from your employer may affect the amount of tax credits you get. This calculator can help you decide if you would be better off taking childcare." Childcare Choices "The government is introducing new ways to help parents with childcare costs. Whether you have toddlers or teens, you could get support." Applying for a Primary School Place and Admission Arrangements for 2018/2019 Oldham Council's website - how to apply for a primary school place and admission arrangements for the school year 2018/2019.